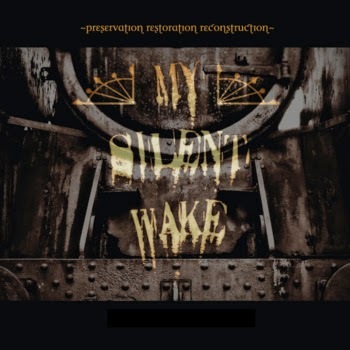 For the uninitiated, UK-based My Silent Wake (MSW) is a goth-infused death/doom outfit that was MSW formed in 2005 by founder member/vocalist/multi-instrumentalist Ian Arkley (Century Sleeper, Seventh Angel, ex-Ashen Mortality, ex-Paramæcium, ex-The Other Window). With a back catalog that features 5 studio albums, two EPs, a split album with The Drowning and a couple of compilations this spiritually-aware collective has long had a stake in the underground metal scene. "Preservation Restoration Reconstruction" (released last November) might not be the group's latest release (that would seem to fall on "The Cages Sessions 03"), but it's most certainly one of their more interesting additions in their long and varied career. With a few instrumental pieces sandwiched between cuts, "Preservation Restoration Reconstruction" finds MSW exploring the nature of acoustic arrangements and, having listened to this in the comfort of an empty house with the lights dimmed low and the headphones on, for that I applaud Ian Arkley and company! With a sound more befitting a folk metal band, Ian and band-mates work their way through 13 numbers over the course of 37+ minutes and if there is a down-side to be found here I have yet to discover it! Having previously only heard MSW in passing I can honestly say that this one has pushed me towards the potential of another new discovery, a "new" band whose back catalog I'll soon enough be diving into! For the time being though (for those who might come calling) I can be found further enjoying this goth/folk collection that has me wrapped up nicely in a warm embrace!